On March 24th I attended the Spring Housing Trends Workshop presented by Jeffrey Otteau, president of the Otteau Valuation Group, Inc. 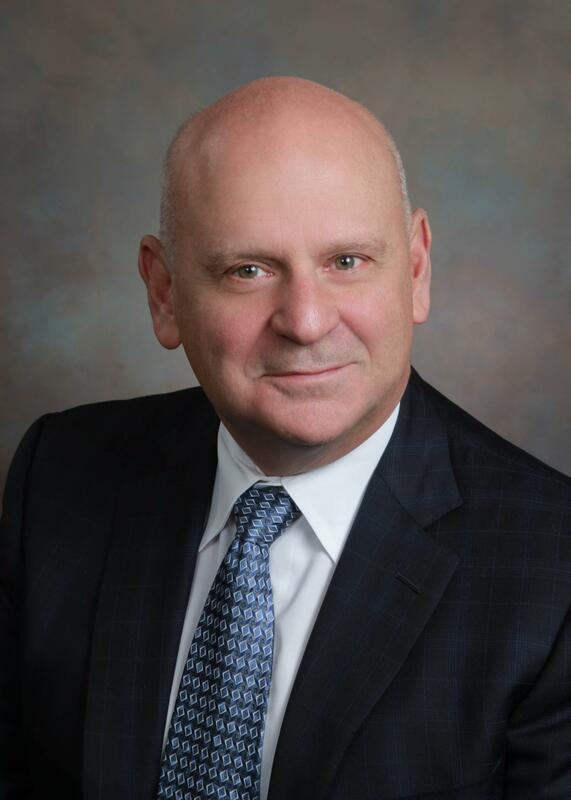 I always enjoy attending Mr. Otteau’s workshops because his evaluations and predictions related to the northern New Jersey housing market are well thought out, well presented and always backed up by impressive research. This current workshop was no exception. 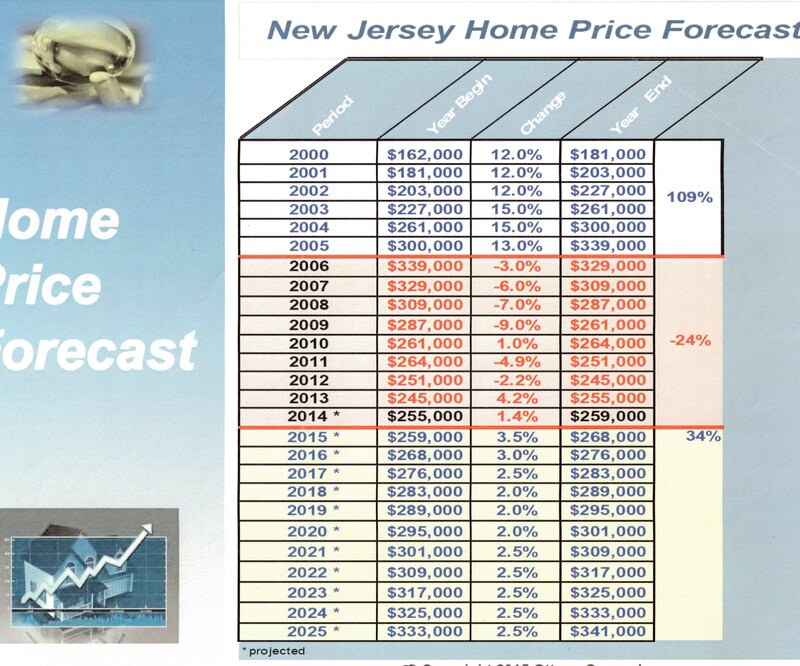 I was keen to hear Mr. Otteau’s thoughts on our current New Jersey housing market to see if my perceptions of 2014 were correct and to hear his forecast for 2015. I am using a few of the graphics Mr. Otteau used in his presentation with his company’s permission. All materials are copyrighted by The Otteau Valuation Group, Inc. Click on the graphics to obtain a larger image. To gain perspective on what the last year has brought, let’s start with this graph which shows that New Jersey is not doing as well as the nation as a whole in job recovery since the recession (which, by the way, ended 6 years ago). As you see, the US has recovered 132% of the jobs lost in the recession while New Jersey has currently recovered just 62%. That’s the 3rd weakest in the nation. This is an improvement, however, since October of 2014 when it was just 30%. New Jersey has some other, ongoing, formidable challenges as well. It’s rated worst state for retirement, highest in personal taxes, highest in out-migration (about 60,000 people leave the state every year – including young people – more on that later), it has the highest share of young adults living with their parents and has the least efficient road maintenance. Bear in mind that these issues are for the state as a whole. With 565 municipalities in 21 counties these situations may be different from place to place. The point is, the overall housing market in New Jersey will be affected by these factors throughout the state. The unemployment rate varies from region to region in New Jersey with the northern counties enjoying a lower unemployment rate (4.2% to 7%) than the southernmost counties (9.6% to 13%). Companies are on the move out of New Jersey as well as evidenced by the high vacancy rates in office buildings. This factor will also suppress job growth. New York City, on the other hand, continues to enjoy major job gains and a robust economy. This affects the housing markets in New Jersey with easy commuting to NYC. Those towns with trains, especially, remain strong housing markets. Mr. Otteau indicated that job creation in New Jersey is off to a strong start with 12,400 jobs added in January which would equate to a gain of 148,000 jobes over the course of a full year. At the same time, new jobs in New Jersey mirror the rest of the country in that a significant portion of those new jobs are of lesser quality, especially in the service sector where wages tend to be lower. the Otteau Valuation Group, Inc.
A direct correlation exists, obviously, between wage growth and housing market growth. 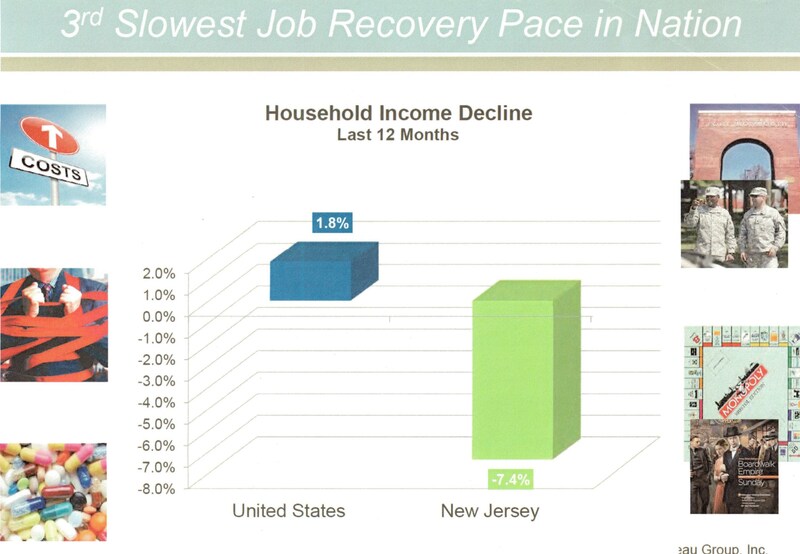 The above graph illustrates how weak New Jersey remains in household income. While the US has added 1.8% to household income in the last 12 months, New Jersey’s residents, on average, have seen their household income decline by 7.4%. Home ownership, not surprisingly, is also down in NJ (down 9%) compared to the US (down 6%) post recession. Median housing prices are down 21% in New Jersey since the peak prices in 2005, whereas the US as a whole is down 12% from the 2005 peak prices. Home prices in New Jersey were, on average, flat (no improvement) at the end of 2014. 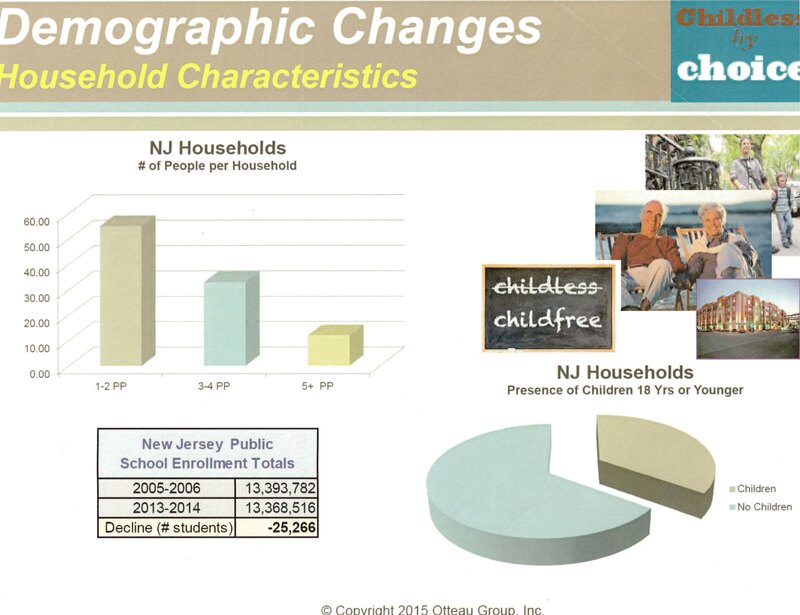 Here’s a fascinating New Jersey demographic change: 7 out of 10 households in New Jersey have no children under the age of 18. The highest average number of people in a NJ household is 1 to 2 people. Enrollment in New Jersey’s school districts is down by more than 25,000 students. These changing circumstances, coupled with New Jersey’s dubious distinction of having the highest out-migration in the nation raises questions of what the state has done with regard to its youth and the future of its housing. Naturally, birth rates will be down in times of economic uncertainty and we’ve got plenty of that as illustrated in the first 2 graphs. The question remains: why is the state not holding on to its Gen X, Ys and Millennials? Mr. Otteau points out that New Jersey’s local governing boards have gone out of their way, down through the years, to create bland (read: boring), safe, predictable suburbs which children of the baby boomers are fleeing in great numbers. Otteau also observes that the properties in many New Jersey municipalities have been zoned out of reach financially for young people with larger and larger plots that are unaffordable to any but the more affluent, established adult population. Starter house prices on any size lot in many NJ towns are unaffordable to young people just starting out which leaves them with the choice of renting (that market is booming), living with their parents (which they are in NJ, in great numbers) or leaving the state, which they are also doing in great numbers. The higher property and income taxes in New Jersey also weed out many young people from buying. The effects of a “baby drought” and out-migration are legion, from the effect on school districts, to property taxes to the future population stability of New Jersey. Smaller household sizes will also have the effect of stunting housing market growth and development. All these factors will have an impact on the future of the housing market in the state as we continue to recover from the recession. And, recovering we are, even taking New Jersey’s challenges into account. The above graph reflects what we call the “absorption rate” or the amount of time it takes (in months) the market to “absorb”, or sell, the housing inventory available. It’s very clear that there’s been improvement since the grim years going back to 2009, 10, 11. What’s most interesting, also, is the slippage in the market between 2013 and 2014. More parts of the state slipped into the longer absorption rates, confirming the impression that 2014 was not an improving year for housing. 2013 was a “great sigh of relief” year, in my opinion. People were finally convinced that the economy was improving based on the media and their own perceptions which led to a surge of pent-up demand and a market improvement in home sales and prices. 2014 saw the engine of recovery sputter a bit as people did not see marked improvement going forward in wages or opportunity. This, in my opinion, led to a cooling of the housing market in 2014 which is confirmed by this graph and the fact that home prices rose 4% in 2013 and only 1.4% in 2014. The housing market sputtered in 2014 also from the fact that the price of homes outpaced the growth of homebuyers’ income and underwriting standards by lenders continued to be tight. It’s apparent that more of the state is in the lower absorption rate this year with predictions of improvement being confirmed. 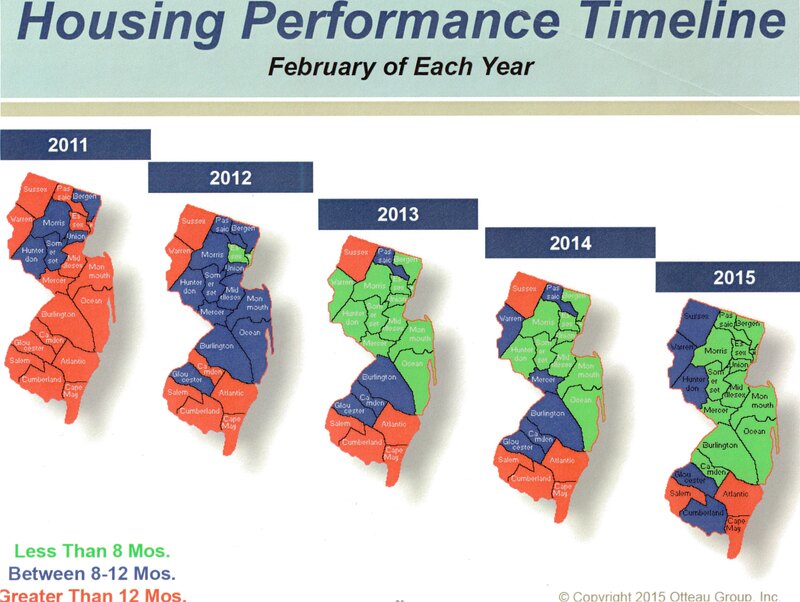 Essex County where I work has the 2nd lowest absorption rate of the NJ counties at 4.6 months. Unfortunately, the southern-most counties have had a terrible housing market for the last 5+ years and continue to have challenges. As you can see, in the western-most counties the news is mixed with some counties improving and some slipping back. Not surprisingly, the counties nearest the major markets of New York City and Philadelphia continue to improve with regard to housing. This continues to be my favorite graphic from Mr. Otteau’s seminars. It shows the gain in home prices during the “boom” years pre-recession, the percentage of value lost during the recession and tracks the recovery of housing prices going forward. You’ll notice that a home that was worth $339,000 in 2005 will be worth that again in 2025 according to this table. The timeline for price recovery has slipped a bit. In October of 2014 the same graph showed that house recovering its value in 2022. Again, these values are averages, taking the entire state into account, including its slowest, weakest markets. 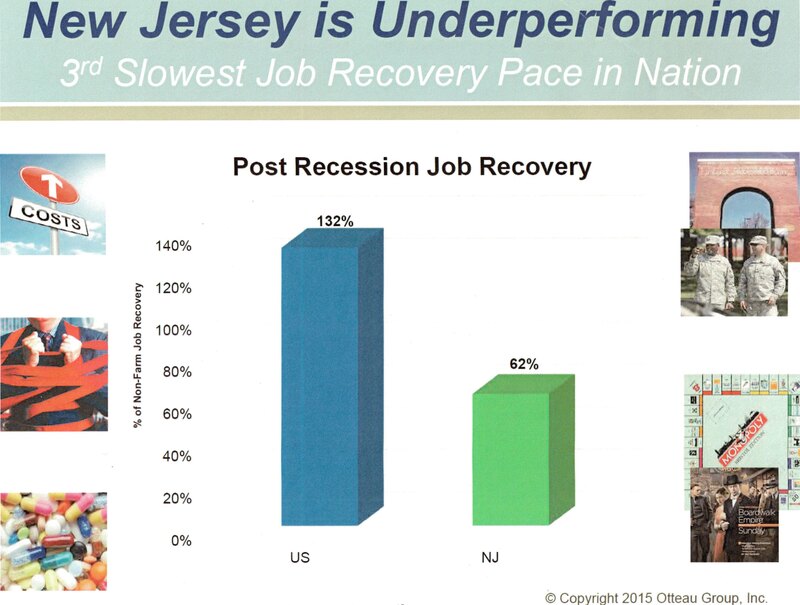 The strongest markets in New Jersey will see recovery faster. Mr. Otteau projects that housing prices will rise about 3.5%, on average, in 2015 and will continue to rise, slowly in years to come. Bear in mind that real estate markets usually have a 5 to 6 year cycle and so we are due for a small correction soon. So, what should we take from all this data? The NJ housing market is continuing its conversion back to a “normal” market. The market was an overheated anomaly in the years just prior to the recession and sunk as the recession’s correction took place. I call the pre-recession market an anomaly because it varied tremendously from markets of the past 50 years and was a unique occurrence fueled by deregulation and the loosening (some say abandoning) of lending standards not seen since the Great Depression of 1929. New Jersey’s “transit villages” continue to be strong markets, even as the state lingers at the bottom of many nationwide categories. A buyer or seller should take all of the above factors into account when approaching the market today. Sellers should not be overly ambitious in asking prices. The market is still tied to many factors which exhibit weak recovery such as wages. Sellers will be inclined to ask for more when they perceive housing in their area is selling quickly, and, being human, they may let their ambitions get the better of them. Even during the boom years an arbitrarily, excessively overpriced home would not sell. That is even truer today in a still weak and recovering market. A buyer should not wait. Prices will rise as the economy improves. The strategy of waiting for a lower price on a property is no longer sound. Prices will go up in stronger markets and stabilize in other markets and the deals are best made now before interest rates also rise with a strengthening economy. For every 1% rise in interest rates a buyer will experience a 9% drop in purchasing power because of the increased cost of borrowing. Mr. Otteau predicts rising interest rates and it’s only the weakness of the overall economy that has kept rates as low as they are today. That will not last much longer. As always, my advice is to enter the real estate market as a buyer or seller when it’s right for you and the circumstances in your life. The important thing is to have realistic expectations of what kind of environment you’re embarking into and that’s where all these facts and figures have value. My approach has always been to give clients all the facts to help them make wise choices rather than sweet talk buyers and sellers with rosy scenarios which may not be entirely real. There’s nothing worse than approaching real estate (or anything else, for that matter) with unrealistic expectations.